Many people are unsure of the size of Skittle Pins or Skittle Balls they have and ask how they can measure the Dimensions. This page provides details along with a simple calculator to assist you with the process. 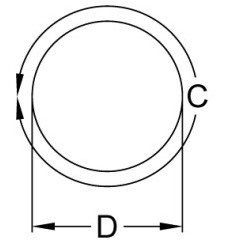 The Two Dimensions required are the Height (H) and Diameter (D). To Measure the Height place the pin on the floor and a flat object on the top of the Pin. Measure the distance from the floor to the flat object. 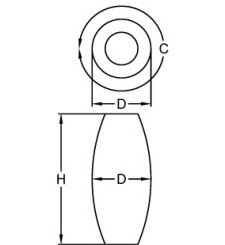 The Diameter of the Pin is specified at the widest part, around the centre. This can be measured using Callipers, but most people don't have these. The easiest method is to measure the Circumference (C), which is the outer surface. Enter the value in the Dimension Calculator below which will give you your Diameter. The only Dimension required for the Skittle Ball is the Diameter (D). As with the pin the can be measured using Callipers, but most people don't have these. The easiest method is to measure the Circumference (C) which is the outer surface. Enter the value in the Dimension Calculator below which will give you your Diameter. Enter The Circumference of your Skittle Ball or Skittle Pin in either Inches or Centimetres, and press Calculate; the Diameter will be specified in both Inches and Centimetres. Note; Wooden Skittle Pins and Skittle Balls tend to go oval over time therefore you are advised to check the circumference in multiple orientations as this will affect the finished size if skimming is required.